Do you agree or disagree with the following statement? Each person should suffer the consequences for the mistakes they make. I'm going to guess that you hedged your bets. You likely didn't say a straight-up true or a flat-out false. Perhaps your answer is like mine: "It depends." For Vanna In, youth pastor at the North Fresno Church, this isn't a theoretical question. This 40-year-old faces the risk of being deported to Cambodia. He'd have to leave behind his American wife and three small kids. He'd have to give up his work with at-risk youth in a church focused on blessing its neighborhood. And he'd return to a country he doesn't remember and to people who speak a language he no longer knows. In one sense, Vanna is reaping the unfortunate consequence of a big mistake he made as a teenager. In another sense, however, this seems a huge price to pay. He's not the only person whose life has been disrupted by immigration and deportation policies. Some stories of deportation seem quite just, others heartbreaking. Immigration is a challenging issue, and I wouldn't pretend to know what is right or wrong. We live in a world with borders. The flow of people across those borders is quite simply a matter for national governments to discuss and regulate. The substantial disparity in living conditions between regions and countries likely creates the huge political issue this is today. Totally open borders might mean massive chaos. Many residents of Africa, war-torn Syria, and Central America would jump at the chance to move to Europe or the US/Canada. Scientists and bureaucrats in Sweden and Germany are still unraveling the long-term impact of their embrace of Syrian refugees. The truth is that immigration, even for compassionate purposes, is a complicated matter. The US has had alternating seasons of openness and restraint toward immigrants. Americans typically frown upon welcoming large numbers of refugees, yet the US government often feels obliged to admit some during humanitarian crises such as the Vietnam War. Tens of thousands of Asian migrants now make their homes here in California's Central Valley. Many of them are originally from Laos, Cambodia, Vietnam, and Thailand. 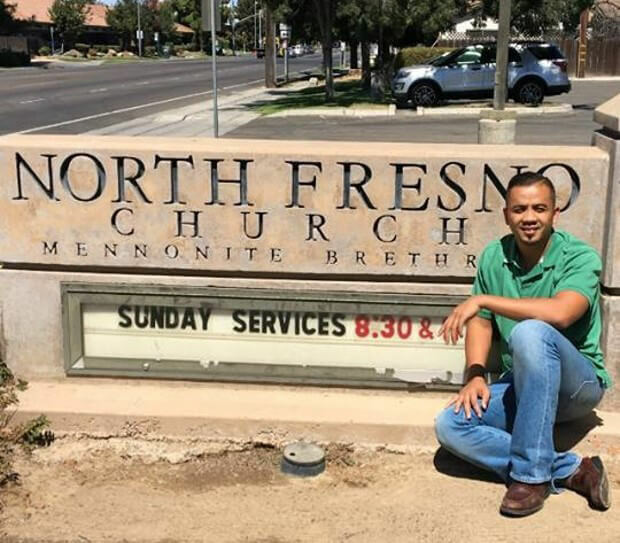 Our church janitor, a number of our church members, a preacher friend of mine, and many, many others help form the rich tapestry of life in Fresno and the surrounding region. As California's fifth-largest city, Fresno has been especially welcoming to foreign-born newcomers. Thirty-seven percent of all households speak a language other than English at home. As a result, Fresno's city hall and police department walk carefully on matters of ethnicity and deportation. Vanna In grew up in a family that fled Cambodia when he was a child. They received refugee status here in this country. Coming to America wasn't a panacea for Vanna. Stories abound about teenage refugees whose parents work so hard to make ends meet that they have little time for their children. This makes young people like Vanna especially vulnerable to recruitment by gangs. He struggled as a teenager and fell into the wrong crowd. During this stage of his life, Vanna admits making mistakes. The worst of these put him in a vehicle involved in a drive-by shooting. He didn't pull the trigger, but California law allows fellow passengers to be charged for murder. Vanna says, "I was 17 at the time of the offense and was really in a bad place at that point in my life. I am sorry and remorseful for my actions." He's not just filled with remorse. Vanna did hard time. Sentenced as an adult, he spent the better part of decade in the state penitentiary. Incarceration changed his life. Vanna found Jesus. Prison worked as it should. His life got corrected. After his parole, he devoted his life to Jesus. The Lord blessed him with a Christian wife. He now has three small kids. And what's more, a local church hired him two years ago as their youth pastor. They knew his past but they also saw his transformation. For this Mennonite Brethren church that was actively reaching its neighborhood, Vanna was a perfect fit. He knew all too well the emptiness felt by many youth, and he saw how a church could take the place of gangs. Some might view hiring Vanna as a risk. But as my pastor friend there asserts, you have to hire in keeping with your priorities. Many churches, he notes, say they value diversity. But at the hiring time, they value education and experience over race and ethnicity. This bias toward education and experience defeats diversity. If you truly want diversity, he reminds me, you have to elevate it and hire based on that as your priority. They hired Vanna over candidates who had better resumes based on the standard qualifications. No one had a history that could match Vanna's. Here's where risk meets reality. Since Vanna has a felony conviction on his record, he can never apply for US citizenship. At present, he has to report to immigration court every six months to learn whether he will be deported or deferred for another six months. At any hearing, an immigration judge can decide to deport him. Imagine living with that. A number of pastors and concerned Christians have mounted a campaign to ask Governor Jerry Brown to pardon Vanna and remove the conviction from his record. The odds of a pardon are slim at best. Even if Gov. Brown heeds our plea, the immigration court doesn't have to stay his deportation order. In other words, it's totally out of our hands. What's the role of believing people in a matter like this? My concern is that too many Christians read everything about Vanna through the lens of their political leanings. I get it. These are challenging issues. But Vanna is not an issue. He's a real person who plays a valuable role here in my community. He made a major mistake, paid a heavy price for it, and is now trying to prevent others from traveling the same tragic path. It's relatively easy to polemicize with blanket statements: "throw them all out" or "welcome them all." Perhaps that's the world inhabited by politicians or talk-show hosts. It's not the world of Jesus or his followers. We're to view each person as a unique individual made in the image of God. Some people are filled with hatred and darkness. Others like Vanna have seen the light. When we are drawn into the messy lives of imperfect people, we sometimes wish they didn't have to suffer the consequences of the mistakes they've made. If we honestly reflect upon the mistakes in our own lives, we might realize that we have somehow made it farther in life than we deserve. Isn't it wise to wish the same for someone like Vanna? In the meantime, I’m writing my letter to Gov. Brown. If you think of it, please say a prayer on behalf of Vanna and his family. He certainly needs it.